Today, the World Health Organization in Geneva, Switzerland raised the alert level of the increasing swine flu outbreak one notch to just one level below a pandemic. Tomorrow I was scheduled to fly through Las Vegas to Sacramento, California, where I was to give a talk May 1, 2009 at the Institute of Transportation Studies at the University of California Davis. The announcement for my talk has been posted in this speaker series. I was so looking forward to seeing colleagues there, including Professor Patricia L. Mokhtarian and Professor Yueyue Fan, who invited me to speak. Also, one of our doctoral students at UMass Amherst, Deanna Kennedy, whose family is living in the Davis area was planning on coming to my talk. Professor Mokhtarian and I, along with Professor June Dong, whom I have written about on this blog, had a multi-year National Science Foundation grant on centralized versus decentralized decision-making on complex networks. It was a fantastic project and collaboration, which generated numerous papers as well several books, including the book, "Supernetworks: Decision-Making for the Information Age," co-authored with June Dong. However, I was advised that, given the increasing numbers of swine flu cases in California, New York, with cases identified even in Nevada and now in eastern Massachusetts, not to fly. There have been several cases in the Sacramento area and a school there has been closed. The staff at the Sacramento airport has been disinfecting certain areas twice an hour -- a thought, somehow, that did not give me much reassurance. This state of events came on so suddenly at a time when one would think the usual flu season is over and done with -- but this is not a usual flu and, presently, there is no vaccine for it. What can one do in such a situation? Tomorrow we will be testing the videoconferencing equipment at the Isenberg School of Management and I will be working with the information technology counterparts at UC Davis to check out what the streaming will look like on their side. The talk is scheduled for Friday, 1:30PM California time, which corresponds to 4:30PM Eastern Standard time. This will be an interesting/novel experience. I love to interact with an audience and we will have to do the best that we can. Ironically or, propitiously, I will be talking about supply chain vulnerabilities and synergies and will try to also bring the reality of the swine flu crisis into the conversations. Our (Anna Nagurney's and Qiang "Patrick" Qiang's) new book, "Fragile Networks: Identifying Vulnerabilities and Synergies in a World of Uncertainty," which is being published by Wiley will be out in a few weeks and the topic could not be more timely. Today we will be hosting Dr. Hillel Bar-Gera of Israel in our UMass Amherst INFORMS Spring 2009 Speaker Series. He will be speaking on a new algorithm for traffic assignment. His talk will take place at the Isenberg School of Management in Room 112 at 11AM. There is a lot of excitement surrounding his visit and presentation. Dr. Bar-Gera's dissertation advisor at the University of Illinois at Chicago was Professor David E. Boyce, who received the Robert Herman Lifetime Achievement Award from the Transportation Science Section of INFORMS (the Institute for Operations Research and the Management Sciences). Professor Boyce is now a Professor Emeritus and is affiliated with Northwestern University. He is also a Fellow of the Regional Science Association International and renowned for his work in transportation and regional planning. Dr. Bar-Gera is spending this year in the US and has been based both at Arizona and at Purdue. Effective and efficient algorithms for large-scale congested networks, including transportation, are critical in evaluating traffic flows on networks, and associated costs and travel times; where new roads should be built (or not); how to determine optimal tolls (a big topic now even in developing countries and especially in China); how to determine optimal and equilibrium product flows in supply chains, and even how to predict flows and prices in electric power generation and distribution networks. In today's competitive economies, one needs to be able to not only conceptualize difficult problems and to model them but also to solve them! Hence, algorithms and good implementation of them are essential to practice. I have been conducting research in large-scale network models, analysis, algorithms, and applications since receiving my PhD at Brown and teaching and researching in this area is always exciting and fun. Plus it is very rewarding to see one's publications not only cited but results in them applied. This semester is the 10th semester that I have been advising and helping the award-winning UMass Amherst INFORMS Student Chapter organize its Speaker Series, which has brought about 70 speakers to the Isenberg School. Students have heard talks this year by Tom Vanderbilt, the author of the book, "Traffic," by Professor Daron Acemoglu of MIT, who is a recipient of the Bates Medal, by Dr. Grace Lin, of Global Solutions at IBM, by Dr. Alex Pentland, the author of the book, "Honest Signals." The series also gave a platform to two of our newest faculty members at the Isenberg School, Professors Ahmed Ghoniem and Senay Solak, to speak on their fascinating and highly original research. Professor Kevin Fu of the Computer Science department at UMass Amherst spoke on implantable medical devices and security issues. This semester, we hosted Professor Ellis Johnson, a member of the National Academy of Engineering, who is from Georgia Tech. Professor Hari Balasubramanian of the Department of Mechanical and Industrial Engineering at UMass Amherst regaled the audience with his experiences of working and researching healthcare at the Mayo Clinic in Minnesota. Professor June Dong of SUNY Oswego informed the audience of the unexpected and wide-ranging impact of supply chain disruptions. On May 8, 2009, we will be hearing the last speaker in this year's series, Professor Robert Pollin, speak about "green jobs." I believe that education takes place both in and out of the classroom. Organizing, running, advertising, etc., such a series requires a lot of hard work as well as financing, which we manage to stitch together creatively. The other day an undergrad (a junior) wandered into my office and we ended up talking for an hour about the speaker series, research on networks, and even PhD programs. This undergrad told me that on Fridays when there is no speaker he is disappointed. Hence, even with the economic and financial crisis affecting endowments in a major way, how can one turn off/shut down such a series?! Yesterday, another undergrad (a graduating senior) came to my office to chat. We talked about the transportation & logistics class that I taught last semester and that he took; we talked about how terrific the Operations Management major is at the Isenberg School; we talked about future opportunities and some contacts that I had had recently with companies interested in advancing their supply chains, and, yes, we talked about today's speaker, Dr. Bar-Gera, and his upcoming presentation on traffic assignment algorithms. One story that this undergrad shared with me that I really enjoyed was that his parents told him that even as a 5 year old he was absolutely fascinated by traffic! So with renewed energy and enthusiasm, we are now in the process of starting to plan next year's UMass Amherst INFORMS Speaker Series. Many thanks for the support that we receive for doing this series. In the end, seeing the audience listening and interacting with the speakers and then continuing the discussions days and weeks afterwards is a priceless dimension of this addition to the educational/intellectual enterprise. I/we can't thank the speakers enough for their brilliance and generosity in sharing their work with us! You have opened the eyes and the world to many! I returned from Northfield, Minnesota last evening. I had been at St. Olaf College since Wednesday and Thursday night at 8PM I gave the Kleber-Gery lecture. Posters for my lecture entitled, "Synergies and Vulnerabilities of Supply Chain Networks in a Global Economy: What We Can Learn from Half a Century of Advances in Transportation," were hanging throughout several of the buildings. My talk took place in the Regents Hall of Science, which is a spectacular building that opened up this past Fall. It is already garnering much attention for its design and environmental friendliness. This lecture was endowed by a former student at St. Olaf, Jeff Brown, who enjoyed both mathematics and economics. Professor Kleber attended my lecture, which was thrilling, as well as the reception given by my host, Professor Steve McKelvey, at his home the evening before. Steve is my "academic brother" since he and I had the same dissertation advisor at Brown University, Dr. Stella Dafermos. I stayed in Northfield at the Archer House Inn, which dates to 1877, and I got the "bridal" room, complete with a canopy bed. Northfield's history includes the 1876 raid of Jesse James and his gang, who robbed the First National Bank in Northfield that year. The town commemorates that event each year in September. It was terrific to see St. Olaf College, which has a rich Norwegian heritage, and the architecture, both old and new, is simply stunning. The serenity of the campus and its beauty plus the attention that I saw given to students and the numbers that showed up to office hours, all speak eloquently of a liberal arts education. I had the opportunity to go to lunch with female students, to visit Professor McKelvey's operations research and finance classes, and to enjoy meeting with economics faculty and students as well as the math, statistics, and computer science faculty. I very much appreciated the energy of the faculty and the attention to detail in planning my visit. Also, the weather was magnificent -- sunny and the temps in the 70s! Faculty, however, still have snow survival gear in their car trunks and my host told me how he trekked one day 3 miles from his home in snowshoes to teach his classes! I enjoyed giving my talk very much and was so pleased when the students packed the beautiful room in -- they were even sitting in the aisles and on the stairs. My talk lasted until almost 9:30PM and I enjoyed the questions and comments afterwards. I even got to meet a legislator from Minnesota who came to hear me speak. St. Olaf is known for its programs in mathematics, science, and music. A sizable portion of its graduates in these fields pursue advanced degrees. One student that I met (many are from Minnesota, Wisconsin, Iowa, and surrounding states) is from Norway and she will be graduating next month and then matriculating into the PhD program at Stanford University in petroleum engineering. She was also involved in the 2009 Rube Goldberg competition and the St. Olaf team won the 2009 national championship beating out major universities such as Illinois and Texas. I got to see the apparatus and to meet with the students who designed it. The winning demonstration can be viewed on youtube. As an academic knows, but much of the public does not realize, despite a regular teaching schedule, no two days for a professor are ever alike. This aspect of being an academic makes one's professional life challenging, always interesting, but also not for everyone. There is no such thing as a "typical" or "routine" day. For example, yesterday, which was a Monday, turned out as follows. In the morning, I discussed, with a producer in New York City, a program that I will be involved in at the 2009 World Science Festival, which will be taking place in mid-June. Last year's festival was the first and it was a huge success. It took place in late spring in NYC and this year's festival will also be in NYC. The festival was modeled after one in Genoa, Italy, and attracted 100,000 participants last year! Office hours followed with students dropping in as much to chat as to discuss work. Then it was time to teach. I am teaching a doctoral course, Management Science II, and the class lasted for two and a half hours. I love teaching the material and the session felt like ten minutes long to me. Then it was time for a scheduled phone conversation with an executive of a multinational firm, who is an Isenberg School of Management alum. Topics under discussion concerned possible internships for our students, and possible projects in supply chain optimization. Coincidentally, one of the topics of my preceding lecture had been trade-offs between different modes of transportation and the effects on product prices. It is always gratifying that we can be both rigorous and relevant while teaching in the Isenberg School of Management! After the conversation, more students came pouring in, and it is always those spontaneous conversations that are the most fun. A student on crutches wandered in and we ended up talking, after discussing employment prospects in operations management, and in transportation and logistics, about soccer and the World Cup. He had actually been a professional soccer player in Portugal (and he was now on crutches because of soccer). Teaching was done for the day and the homeworks graded so it was time to complete the service duties. I have the honor of serving as the Chair of the 2009 WORMS (Women in Operations Research and the Management Sciences) Award of INFORMS. In the capacity as Chair, I get to select the members of the committee. Yesterday, all the committee members were confirmed and we have a terrific committee in place! They include faculty at business schools and engineering schools as well as a parctitioner. The award will be announced at the INFORMS National Meeting in San Diego next October and the closing date for nominations is July 1, 2009. As for research, there was good news on this front, too. Two of our papers, which we revised recently, have now been officially accepted for publication. One is on electric power supply chains with application to New England. The other paper is on the horizontal integration of multiproduct supply chains and associated synergies. These papers were co-authored with associates and students that I work with through the Virtual Center for Supernetworks at the Isenberg School at UMass Amherst. The former paper will be published in the journal, Naval Research Logistics, and the latter paper, in the International Transactions in Operational Research. This coming Thursday, I will deliver the Kleber-Gery Lecture, which is an endowed lecture, at St. Olaf College in Northfield, Minnesota. St. Olaf College is a liberal arts college situated on a hill in Northfield, which is 35 miles south of Minneapolis. 40% of the undergraduates concentrate in the natural sciences or mathematics. The topic of my Kleber-Gery Lecture is supply chain vulnerabilities and synergies in a global economy and what 50 years of advances in transportation tell us. My host will be Dr. Steven McKelvey, who is the Chair of the Department of Mathematics at St. Olaf. Dr. McKelvey received his PhD in Applied Mathematics from Brown University and we overlapped for a few years. 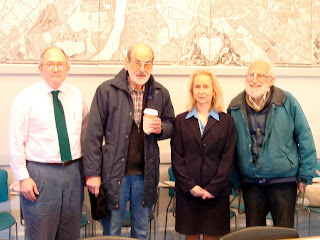 Both he and I had Professor Stella Dafermos as our doctoral dissertation advisor. Dr. McKelvey's dissertation focused on partitionable variational inequalities with applications to spatial price equilibrium and transportation network equilibrium problems. Professor McKelvey tells me that the Kleber-Gery lecture was made possible through an endowment given by a student who admired both Professors Kleber and Gery, who are now emeriti professors. One was a mathematician/statistician and the other one an economist. The lecture alternates between the two departments but the invited speaker should be of interest to members and students of both departments. The lecture is open to the public and is meant for a general audience. My lecture will take place this coming Thursday in the Regents Hall of Science, which is a new building on the St. Olaf campus. I am very honored to have been selected to give this lecture and am delighted that I will be visiting Northfield and St. Olaf later this week. Coincidentally, and interestingly, Massachusetts also has a town named Northfield, which is in western Massachusetts. Northfield, MA is the location of the prep school known as Northfield Mount Hermon, whose head is Mr. Tom Sturtevant. One of my esteemed colleagues at UMass Amherst, Professor Murugappan Muthukumar, of the Department of Polymer Science and Engineering, who also happens to be a neighbor of mine, tells me how important it is to accept invitations to speak at not only universities but also colleges. This past year, among many talks at universities and other venues, I spoke last September at Smith College, an all female college in Northampton, MA, which is in proximity to Amherst, and I had a delightful time. The audience of very bright students and engaged faculty helped to kick off a most interesting academic year! Fragile Networks -- Our Book is Off to the Publisher! Today, we shipped our book, "Fragile Networks: Identifying Vulnerabilities and Synergies in an Uncertain World," to John Wiley & Sons, Inc. The book is about 350 pages in length and we submitted it in camera-ready form. Qiang "Patrick" Qiang and I have been working on this book for the past year and it is based on many years of research. Wiley has already begun to publicize/market the book, which should be out in late Spring/early Summer. We were asked to choose the cover for the book out of three that Wiley had designed for us. I canvased faculty, administrators, staff members, graduate and undergraduate students, as well as friends and neighbors as to their favorite. Interestingly, the cover that undergrads uniformly liked was different from the cover that doctoral students all unanimously picked. We provided feedback to Wiley and will see what the ultimate cover design will be. For now, I have been busy starting to disseminate the great news that the book will be out soon and have noted its upcoming publication in talks that I have given this year in Dallas, Vienna, and Ithaca. Next week, I will be giving a big talk in Minnesota and will also mention our new book. 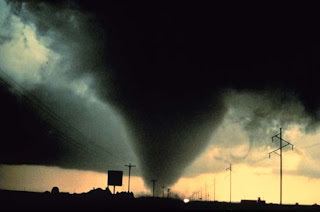 I enjoy hearing the stories that my husband comes home with -- from the students driving the truck with the radars from Amherst to Oklahoma and back -- to the logistics involved in finding housing for the researchers as they literally chase tornados in real-time. The research that is conducted under the auspices of this ERC is critical and is fascinating from scientific and practical perspectives. Weather affects everything that we do and the precise prediction of dangerous weather can literally save lives. Plus, the decision-making surrounding extreme weather events involves many stakeholders from government planners to news agencies to citizens. Hence, projects that CASA undertakes also stimulate research in optimal distributed/decentralized decision-making and networks, which is one of my research passions. As academics, we teach, we conduct research, and we do service to our universities and professions plus communities. This semester I am serving on the Search Committee for the new Dean of the Isenberg School of Management. Dr. Tony Butterfield has been serving as the Interim Dean of the Isenberg School for the past two years and the school is poised for new levels of achievement in research and education. The Search Committee has members not only from the Isenberg School but also from other departments at UMass Amherst, as well as administrators, students, including one of my doctoral students, Patrick Qiang, and a representative from our Business Advisory Council, Mr. Paul McDonald, who is also an alum. The committee is chaired by the Dean of the College of Engineering, Dr. Mike Malone. The committee is terrific and we have been very busy identifying finalists for the position who have already started to come to campus to meet with the students, faculty, staff, members of the Business Advisory Council, and committee. We are all very excited about identifying our new Dean and leader. This past weekend I spent at Brown University, my alma mater, which is in Providence, Rhode Island. Brown University is one of the oldest universities in the United States and had the first undergraduate engineering program in the country. I have four degrees from Brown and my husband has two. Brown's President is Dr. Ruth Simmons, who is the first African American female to lead an Ivy League University. Her story is truly amazing -- the daughter of Mississippi sharecroppers, she is one of eleven children. She has been the President of Brown since 2001 and, under her leadership, Brown has reached new heights in scholarship and education. For once, I was the "trailing spouse." My husband was invited to be on a career panel, organized by the Department of Physics at Brown. The Saturday program brought back alumni of the Physics Department, from undergraduates through doctoral alumni. The program was the initiative of President Simmons, who also made an appearance, and declared that the physics career event was one of the most successful ones to-date. Alumni from industry, including IBM, and from academia, including Williams College and Johns Hopkins University, spoke on their experiences to an audience of students, faculty, and administrators. Physics Brown alums that returned to campus and participated in this special event also included venture capitalists, employees of national research labs and of financial firms on Wall Street. My husband discussed his experiences, as a tenured professor at the University of Hartford in the College of Engineering. Of course, a visit to Brown enabled me to see my former dorms, from Andrews Hall on the Pembroke Campus, to Diman House next to the Sharpe Refectory, to the Russian House. Brown has expanded its medical school and Life Science building and its athletic facilities but has managed to preserve its historical buildings and unique layout and design. Walking on the East Side of Providence, where Brown is located on College Hill, brought back so many wonderful memories. Coincidentally, yesterday, April 5, 2009, was the anniversary of my doctoral dissertation advisor's death. My advisor, Dr. Stella Dafermos, was the first female to hold an appointment in the Divisions of Applied Mathematics and Engineering at Brown. I was her first doctoral student. She passed away in 1989 and her work continues to be cited to this day and to make an impact in fields from transportation science to computer science. We stopped by the Swan Point Cemetery on Blackstone Boulevard, where Stella is buried, to pay our respects. Walking through the Brown Green, I visited the statue of the Brown mascot, the Brown bear, with the inscription that contains the terrific phrase: "To Symbolize those Qualities of Strength, Courage, Endurance, which go Far to Make Men Invincible." Brown and Providence have changed since I graduated but the beauty of the architecture and landscaping, plus the friendliness of the people remain! As for the food -- it is hard to top an Italian meal on Atwell's Avenue in the Federal Hill district of Providence! Dr. Alex Pentland and "Honest Signals"
Yesterday, we had the distinct honor and privilege of hosting Dr. Alex "Sandy" Pentland of the Media Lab at MIT. Dr. Pentland spoke in the Spring 2009 Speaker Series in Operations Research / Management Science that is organized by the UMass Amherst INFORMS Student Chapter. I am the Faculty Advisor of this student chapter which is based at the Isenberg School of Management. Dr. Pentland's talk was on "Honest Signals," which is the title of his latest book published by MIT Press. Dr. Pentland discussed his research on mining honest signals, that is behaviors that are sufficiently expensive to fake that they can form the basis for a reliable channel of communication. Examples of such signals are: influence, mimicry, activity, and consistency. By wearing a device known as a sociometer data can be captured on these signals, digitally processed, and then analyzed. The beauty of the research and technology, which has been called by Technology Review as "A technology poised to change the world," is that dyadic interactions between people can be measured and quantified. The datasets generated are massive since they are over space and time. Groups from students to back office workers to bank employees and poker players have worn sociometers and their interactions codified. Scenarios from sales and negotiations to dating and hiring have been analyzed and signaling has been found to accurately predict "who will succeed, and who will not." Pentland spoke on how these signals date to primates who interact in groups and the signals are objective and essentially impossible to fake. His book, which I could not put down and finished in one reading, contains footnotes and citations to the scholarly literature. In it, he discusses the value of brainstorming and how enthusiasm can be spread by "social circuits," plus the importance of enthusiasm and charisma (and how it can be quantified and measured). The animations in his presentation included the flows of email versus face-to-face communication of employees in an organization as well as the movements of people in San Francisco. He has also studied interactions of humans in a hospital setting. How often can one say that a book can change the way one looks at the world?! If you read "Honest Signals" you will become more aware of human interactions and you will look at human communication in a deeper way. This is a book that I will return to in order to further plumb its pearls of wisdom and terrific and provocative phrases such as: "honest signals combine to characterize social roles - leading, teaming, listening, and exploring;" "conversation is biologically expensive," and "the signals are a reading of basic brain functions." One of my favorite quotes from the book is: "If you go to a session at the United Nations, say, you will see a person present written speeches in a designated order, and most people listen to a translator rather than the speaker themselves. The result is that while influence due to signaling has been reduced to near zero, the experience is also terminally boring." The audience for Dr. Pentland's talk included faculty and students (from undergraduate to PhD) from the Isenberg School, from Engineering, and Computer Science as well as an economist from the University of Vermont, among other guests. The University Bookstore was kind enough to have copies of Pentland's book available for purchase and signing. The lunch at the Chancellor's Room at the University Club at UMass Amherst was, as always, delicious, but it was the conversations that the students and I had with Pentland that we will always treasure. Pentland is a genius and I don't use that word lightly. As his talk, book, and our conversations signalled, "face-to-face communications will not be replaced by virtual communications, since the former change both the messenger as well as the receiver." And, of course, there is another "Amherst is the Center of the Universe" moment here -- Pentland holds the same chaired professorship that the founder of Artificial Intelligence (AI), Dr. Marvin Minsky, held. Dr. Minsky's daughter, Margaret, who has a PhD in Computer Science from MIT, is a neighbor of mine in Amherst. I would like to thank Dr. Kieran Donaghy, the Chair of the Department of City and Regional Planning at Cornell University, for being such a wonderful host during my visit to Cornell. I was really thrilled to have Professor Walter Isard, who will be 90 years old in a few days, and who is the founder of the field of Regional Science, attend my talk yesterday. Plus, Professor Sid Saltzman also came to my talk. Professor Saltzman is in his late 80s, and is the father of Matt Saltzman, who is well-known in the Operations Research community and is a Professor at Clemson University. Having Professor Tim Mount of Agricultural Economics in the audience also brought such wonderful memories of collaborations with Cornell folks on spatial price equilibrium problems, ad valorem taxes, and applications to the dairy industry. We had dinner last night in Ithaca and Dr. June Dong and Professor Mark Turnquist joined Professor Kieran and me at "Willow," a restaurant that alone is worth the travel to Ithaca, New York! Nothing like a great conversation about transportation, regional science, and the state-of-our universities over a delicious meal! The stories that we shared were terrific and, of course, we had to mention my dissertation advisor at Brown University, Dr. Stella Dafermos, who died almost exactly 19 years ago. Her first academic appointment after receiving her PhD was at Cornell. Dr. Mark Eisner, who also attended my talk, came up to me afterwards and told me how he, George Nemhauser, and Stella had worked together when she was at Cornell. What would a speaking engagement be without another travel/transportation adventure?! Today I woke up at 5:30AM (I do recommend the Statler hotel at Cornell -- great service and it is quiet) and caught the 6:00AM shuttle to the tiny Ithaca airport only to find out that the second leg of my USAIR flight from Philly to Bradley was cancelled. I was rebooked on a flight 2 hours later. Security at the Ithaca Airport took about 1 hour to process 10 people but the pain was mild since I saw Professor Linda Nozick of the School of Civil and Environmental Engineering at Cornell (a colleague of Turnquist's) ahead of me in line. We talked through the 1 hour delay in Ithaca and got front row seats on the flight to Philly. Another case of having an ideal "seatmate" to fly with. Our discussions ranged from infrastructure management and systems engineering, to teaching, to research, to having kids! Nozick was flying to DC to give a presentation at the Department of Energy and I was trying to make it back to UMass Amherst for an exit interview with a Dean's candidate (I did not make it). Today I will be speaking at Cornell University and will be hosted by Dr. Kieran Donaghy. I will be speaking in the Regional Science and Policy seminar series. My talk will be on global supply chains and the associated vulnerabilities and synergies today. My host I have known from the Regional Science community and I hope to also be able to connect with faculty and students in Operations Research and Civil Engineering at Cornell. My dissertation advisor at Brown University, Dr. Stella Dafermos, who was the second female in the world to receive her PhD in Operations Research was at Cornell after receiving her PhD from Johns Hopkins University. She, with her husband, then moved to Brown University. Stella Dafermos died at the age of 49 and she was one of the few honored with an obituary in the journal Operations Research (which I wrote). I used to serve on the Cornell Supercomputer National Allocation Committee and would fly regularly to Cornell and stay at the wonderful Stadtler hotel. I am very much looking forward to seeing Cornell again.